Philadelphia’s Dock Street Brewing Company has come up with a seriously "heady" brew in honor of AMC's zombie soap. Philadelphia’s Dock Street Brewing Company has created a new beer brewed with smoked goat brains as a tribute to AMC’s The Walking Dead. On March 30th, the brewery will be serving the beer, named Dock Street Walker, and showing the season finale of AMC’s zombie soap opera at its pub. In similar news, Right Brain Brewery will be releasing their Mangalista Pig Porter, brewed with actual pig’s heads, on April 12th. We’re anxiously waiting for a third brewery to flavor beer with animal heads and innards before officially labeling this a trend. Dock Street Walker (7.2% ABV) is an American Pale Stout, brewed with substantial amounts of malted wheat, oats, and flaked barley for a smooth, creamy mouthfeel. Fuggle hops provide delicate, earthy notes, while the cranberries create a sinister, bloody hue, and a slight tartness. The pre-sparge-brain-addition provides the beer with intriguing, subtle smoke notes. In true walker fashion, don’t be surprised if its head doesn’t hang around forever. 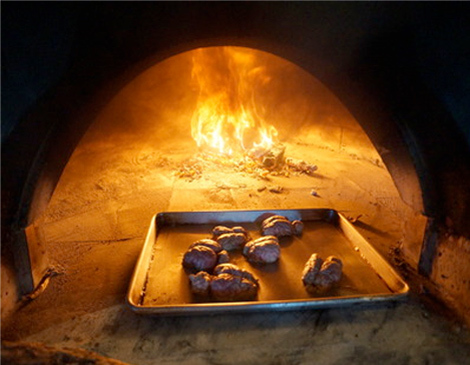 And, just for kicks, here’s a picture of the goat brains being smoked in the brewery’s wood-fired oven.